The importance of employee recognition cannot be understated. It's all about improving employee morale, or, boosting the general attitude and happiness of your employees. High employee morale is essential to improved productivity and even your company’s success. When a company’s culture creates a sense of purpose, team loyalty and pride, along with trust and faith in leadership, it influences everything and everyone in the company. Service Award Programs provide great opportunities for management to honor experienced employees for their knowledge and contributions, as well as to show appreciation for their dedicated and loyal service. Honoring and recognizing employees in front of their peers, helps them feel even more appreciated. When an organization focuses on employee morale, most will see a dramatic improvement in productivity. Then, as long as management continues to work on creating a culture of employee recognition, productivity should steadily improve. A Service Recognition Program should be the foundation of your comprehensive recognition strategy. Employees Want Recognition! According to a Work study published by Randstad, over 75% of employees said feeling valued was more important than a list of other options. Employees want and need to feel appreciated and be recognized for their achievements and service. Engaged Employees is the ultimate Goal ! 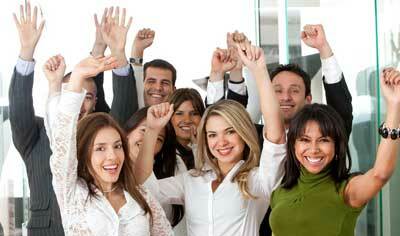 To achieve high levels of employee engagement and morale requires lots of Recognition. This includes programs such as Service Awards, Exceptional Performance Awards, Peer-to-Peer Recognition, and many other ways to continually recognize and reward employee loyalty, achievements and contributions.